NEW YORK--(ENTERTAINMENT WIRE)--March 22, 2000-- Turner Network Television (TNT) continues its TNT Masters Series with a tribute concert event celebrating the music of folk-pop legend Joni Mitchell. Highlights from her body of work will be performed by some of the most celebrated names in contemporary music, including Shawn Colvin, Elton John, Wynonna Judd, Chaka Kahn, Diana Krall, k.d. lang, Richard Thompson, Cassandra Wilson, among others. Special guest and additional artists will be announced in the coming weeks. Mitchell will also perform. 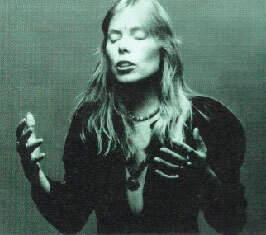 AN ALL-STAR TRIBUTE TO JONI MITCHELL will tape on Thursday, April 6, at the Hammerstein Ballroom in New York City. Ashley Judd will host AN ALL-STAR TRIBUTE TO JONI MITCHELL, which is scheduled to air on Sunday, April 16, at 9:00p.m. ET/PT. The TNT Masters Series showcases individuals whose contributions have had a profound influence on contemporary culture. TNT launched its Masters Series in 1998 with Burt Bacharach: One Amazing Night and followed with An All-Star Tribute to Johnny Cash in spring 1999, which garnered an Emmy® nomination. One Love: The Bob Marley All-Star Tribute premiered in December 1999. "Joni Mitchell is an artistic visionary whose contributions to music and culture reflect the essence of the TNT Masters Series," said Bradley J. Siegel, president of general entertainment networks, Turner Broadcasting System, Inc. "Celebrating her music with performers who have all been influenced by her work will make for an unforgettable evening." "We see this television special as a gift to an outstanding artist for an inspiring career that spans more than 30 years," said Jeb Brien, executive producer of the special. "The TNT Masters Series is the ideal vehicle for such a tribute." Mitchell's groundbreaking style has made her an artistic legend. An innovator in folk, jazz, pop, avant-garde and world music, Mitchell is a four-time Grammy® Award winner and was inducted into the Rock and Roll Hall of Fame in 1997. Her Miles of Aisles (1974, #2), The Hissing of Summer Lawns (1975, #4), Hejira (1976, #13), and Court and Spark (1974, #2) are considered among the most influential and important albums of the rock era. Some of her many classic hits include "Big Yellow Taxi," "Free Man In Paris," "Help Me," "Both Sides Now," and "Woodstock." Both Sides Now, her latest album, is scheduled for release on March 21 on Reprise Records. A passionate song cycle about love in all of its manifestations, Both Sides Now features sultry, dramatic renditions of 12 love songs from the 1920s to the present. AN ALL-STAR TRIBUTE TO JONI MITCHELL will be produced for TNT by Automatic Productions. Jeb Brien is executive producer, Louis J. Horvitz is director. Monica Hardiman is producer, and Ali Gifford is talent producer. Larry Klein is the musical director. Sandy Shapiro is executive producer for TNT. Jodi Hurwitz is executive producer for Automatic Productions. Automatic Productions is a television production, distribution and packaging company headquartered in New York City. It has a diverse slate of music variety series and specials, and is a leading supplier of entertainment programming for network, cable and broadcast syndication. Recent projects include A&E's Emmy and CableACE Award-winning series Live By Request; the critically acclaimed weekly television music series Sessions at West 54th; TNT's An All-Star Tribute to Johnny Cash and Britney Spears In Concert for the Disney Channel. Turner Network Television, currently seen in 77.1 million homes, is Turner Broadcasting System, Inc.'s 24-hour, advertiser-supported service offering original motion pictures and miniseries; original series, non-fiction specials and live events; contemporary films from the world's largest film library, the combined Turner and Warner Bros. Film libraries; exciting NBA sports action; exclusive coverage of both the 2000 Winter and 2001 Summer Goodwill Games; and popular television series. This article has been viewed 10,199 times since being added on March 24, 2000. Have these 'facts' been checked out or are they assumptions?